Terrenas Paradise is excited to introduce you to The Land of The Upright Man. This special seassion ensures enormus dose of amazing music experience, which let us perceive we are all created for greatness. With our dreams and ideas we can all be a Upright Man. Let the music set you free. 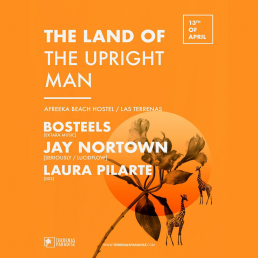 The Saturday of 13th of April join us at Afreeka Beach Hostel & Music Bar to feel magical vibes with our dearest and most cherished friend from Ibiza Jay Nortown delighting us with his best rythmes, with Terrenas’ very own son Victor Bosteels and with our special guest Laura Pilarte Humeau, who complement the soiree’s lineup. Cover $500 At The Door!!! Salty Sand SS19 Las Terrenas.